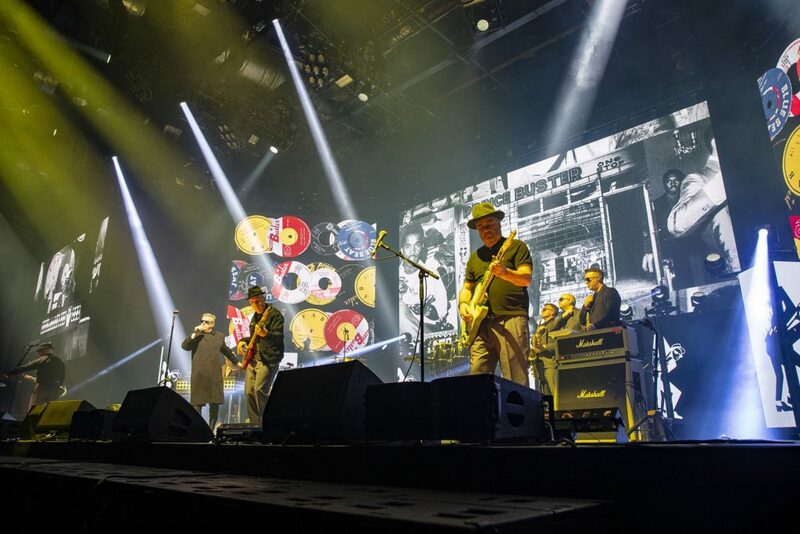 Busy London UK based lighting and visual rental company Colour Sound Experiment supplied video – including LED screens, cameras, PPU and crew – to iconic British ska band Madness’s most recent tour. 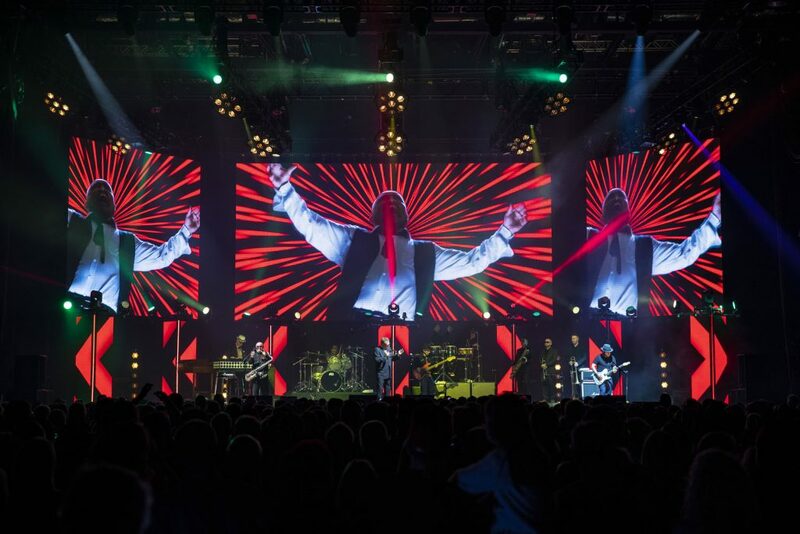 The “Sound of Madness” arena tour was production managed and designed by “Luton” Pete Hosier, who was also the LD, with the video elements co-ordinated by Toby Vogel, who has worked with Madness since 2010. 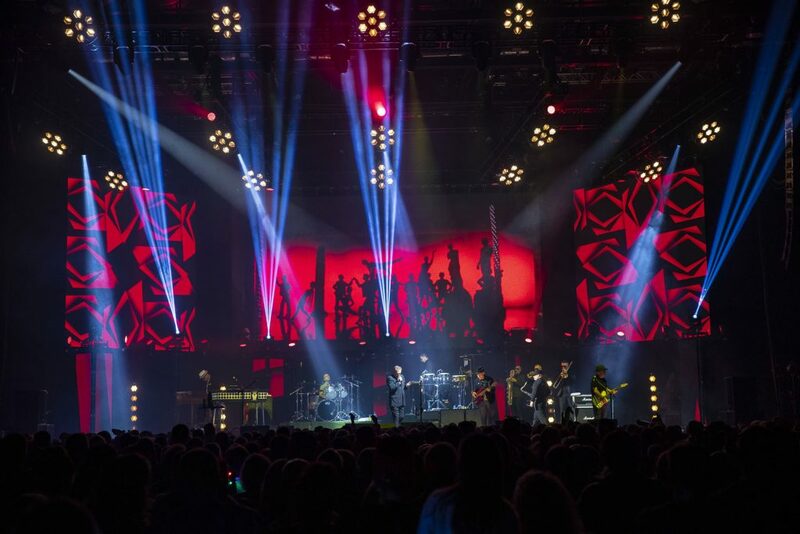 Video has been a massive part of their live show, especially for the last three of these biennial arena tours, and the screens were in use for most of the band’s lively, up-beat set. The band themselves take an active interest in the medium, and it helps reinforce the humour, narrative and energy of the music of one of the UK’s most enduringly popular artists… formed in 1976. 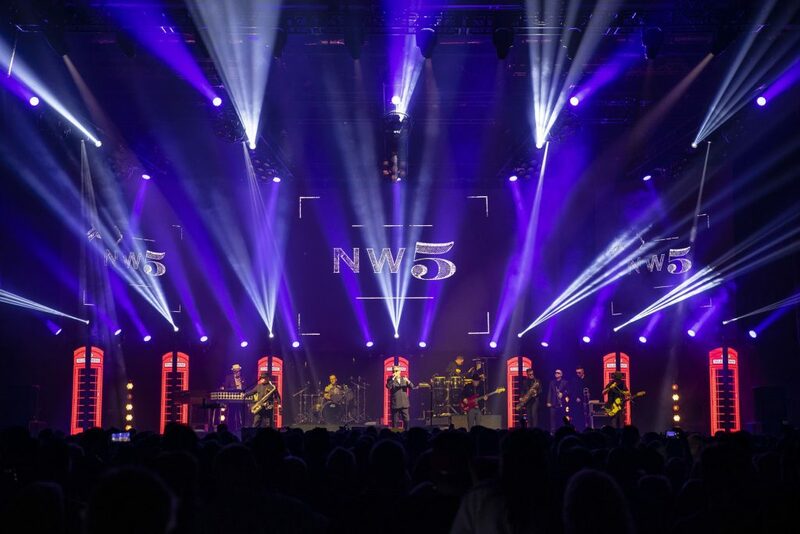 Utilizing over 175 square metres of Colour Sound’s BT-6 and BT-7 mm LED product, the main screens comprised a 10-metre-wide by 5-metre-high upstage centre surface, flanked either side by two 5 x 5 metre ‘return’ screens positioned diagonally upstage/downstage. The band have long been fans of the ‘wrap around’ screen look, and this dramatically increases the depth and dynamics of the stage space. Further offstage were two 8-metre-wide by 5-metre-high IMAGs, and all of these were flown from their own trusses and made from the 7 mm. Additionally, seven 2-metre-wide by 3-metre-high 6 mm screen sections were rigged on vertical trussing towers positioned upstate of the band curving around the back line. These were used primarily as digital set pieces, displaying well known Madness music-related images like lampposts, phone boxes, etc, as well as showing ambient content. 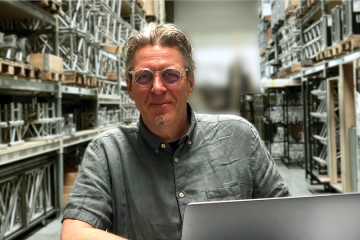 As well as co-ordinating all the video hardware, Toby creates, generates and formats the content, an area in which he works closely with band members Chrissy Boy (guitarist Chris Foreman) and keyboardist Mike Barson. New material was created for this tour inspired by Robert Wise’s classic 1965 musical drama movie The Sound of Music… with a Madness twist!! There was also other original content and some reimagined artwork from previous tours and landmark promos. 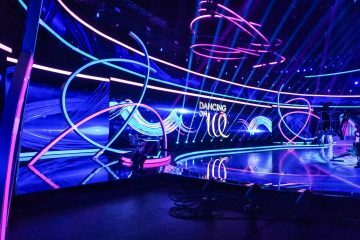 Colour Sound supplied a three camera/Blackmagic 2ME PPU package, plus video director Phil Woodhead, who brought his own aesthetic to the visual mix as an integral part of the video team. Phil also worked on the 2016 arena tour. Two cameras were positioned in the pit with wide angle lenses, with one at FOH fitted with a long lens. Toby’s control system was based around Mac Pro Resolume 6 media servers which he ran from FOH, with Phil’s camera mix fed in via Blackmagic external capture cards. Toby enjoyed gathering and editing all the content, and, as the hits kept rolling, it was clear to see that plenty of fun had been had in the process! A favourite piece of video footage for this tour was for Madness classic “The Prince”, a tribute to the late Jamaican ska legend Prince Buster (the band’s name came from one of his songs), which Toby created using images of vintage Prince Buster 7-inch (vinyl) singles sleeve artwork. Toby appreciates many things about working with Madness. Their distinctive and different sounds and flippant rebellious jauntiness permeated his youth, and one of the first pieces of music he ever purchased was the single “My Girl” in 1979. “The shows look and sound great, are huge fun, and the band always have a laugh on stage” he stated. 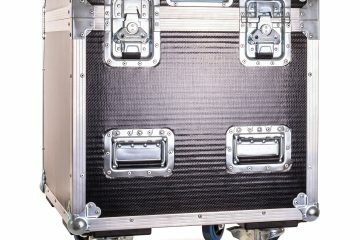 He reports that the screen was very reliable, and that it is always a good experience to be working with Colour Sound. Toby has known Colour Sound’s H (Haydn Cruickshank) for many years – the two have also collaborated on Underworld with H as LD. He’s known Colour Sound’s Jo Beirne since the glory days of XL Video. Toby has also worked with Pete Hosier as LD on other tours including The Libertines and The Specials, and it’s proved an excellent combination of skills and personalities. Pete Hosier comments: “We love H and Jo from Colour Sound! They are fantastic to work with, lovely people, great kit, top crew and everyone is looked after well. As a company Colour Sound share the same beliefs and philosophies that we do. They have built and built and gone from strength to strength without selling out their core principals and by investing in excellent equipment and talented people with great attitudes and work ethics”. On Madness, Pete says they are “a great British music institution and amazing people” and he looks forward to the tours which are like “one big family outing every two years!” His production colleagues on the road included tour manager Steve Martin, band assistantJim O’Gara and production co-ordinators Anneka Hill and Sam Carter.